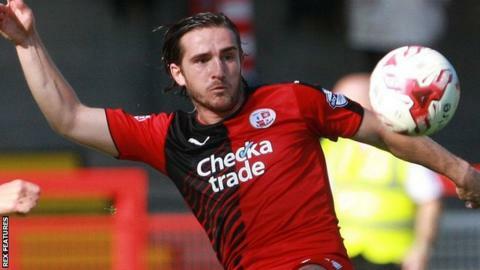 Luke Rooney's stunning stoppage-time goal earned Crawley a point at Exeter. Alex Nicholls had given City a great start when he lashed home Tom Nichols' pass after Clinton Morrison's dummy. Sonny Bradley levelled as he found himself unmarked to head home Simon Walton's corner. Nicholls struck a 20-yard half-volley to put Exeter back in front on the stroke of half-time, before Rooney's audacious 91st-minute shot flew past Bobby Olejnik and into the top corner. "I think it was deserved. It always looks harsh on the home when you get a goal in the 92nd minute, but we kept plugging away. "We showed a spirit coming from a goal down twice and we've come a long way since the start of the season. It's pleasing we are making progress and we are far from the finished article but we are getting a way to play and we're working hard at it. "I thought the substitutes made a massive part of it, and something tactical genius from myself. "When you pick eleven and I think that's my best eleven for the game and you give me 70-80 per-cent. I ask the players who come on to continue the momentum and the ones today made it." Match ends, Exeter City 2, Crawley Town 2. Second Half ends, Exeter City 2, Crawley Town 2. Goal! Exeter City 2, Crawley Town 2. Luke Rooney (Crawley Town) left footed shot from outside the box to the top left corner. Lee Barnard (Crawley Town) wins a free kick in the attacking half. Joel Grant (Exeter City) wins a free kick in the defensive half. Attempt missed. Jimmy Smith (Crawley Town) right footed shot from outside the box is too high from a direct free kick. Lee Barnard (Crawley Town) wins a free kick in the defensive half. Attempt saved. Gwion Edwards (Crawley Town) right footed shot from the right side of the box is saved in the top centre of the goal. Substitution, Crawley Town. Lee Barnard replaces Matt Harrold. Attempt saved. Shamir Fenelon (Crawley Town) right footed shot from the centre of the box is saved in the centre of the goal. Attempt missed. Gwion Edwards (Crawley Town) header from the centre of the box misses to the left following a corner. Corner, Crawley Town. Conceded by Arron Davies. Simon Walton (Crawley Town) wins a free kick in the defensive half. Gwion Edwards (Crawley Town) wins a free kick on the right wing. Matt Harrold (Crawley Town) is shown the yellow card for a bad foul. Arron Davies (Exeter City) wins a free kick in the attacking half. Simon Walton (Crawley Town) wins a free kick on the right wing. Foul by Arron Davies (Exeter City).